Specialty Cocktail Recipes for every day and special day celebrations. Cheers! 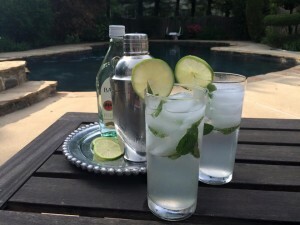 I know it sounds like something you should share with fairies and unicorns but this refreshing cocktail is perfect for a beautiful summer day! 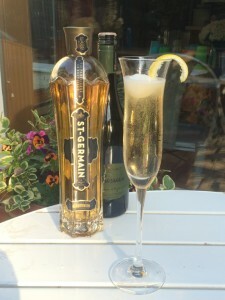 Into a champagne flute, pour in St. Germain, add Prosecco, garnish with a Lemon Twist and just before serving, top with the frozen ball of Lemon Ice. Sip and enjoy! Do ahead: Line a cookie sheet or plate with parchment paper. Using a melon baller, scoop small balls of Lemon Sorbet or Lemon Italian Ice and place on the parchment paper and freeze until solid. Once the balls are frozen solid, you can move them into a bag to save freezer space. Put the mint in a shaker and lightly muddle (smash) the leaves with a muddler or the back of a spoon. Pour in the Rum, Lime Juice and Simple Syrup and fill with Ice. Shake! Pour into highball glasses. Top with Club Soda and garnish with Mint and/or Lime. Experiment by swapping lemon for the lime or muddling some ripe blackberries with your mint. Simple Syrup is really simple. Just put 1 cup of sugar and 1 cup of water in a small saucepan and bring to a boil. Turn down to a simmer for a few minutes to dissolve all the sugar. Store in a tightly closed glass jar in the refrigerator for up to 4 weeks. Enjoy!